Living in Southern California has its perks — perfect year-round weather, sunshine, proximity to the beach and the mountains, and of course amazing opportunities and choices for resident and commercial gardens alike. As with any popular area, there are lots of people looking to spend their days here, inside and outside the garden. Southern California, like anywhere else, has its share of natural disasters, too (earthquakes, anyone?). A main concern for homeowners in southern California are mudslides, which can cause more than their share of problems. (I know you’re picturing your car or your house sliding down the hill into an epic sinkhole right now…yep, that’s what can happen.) 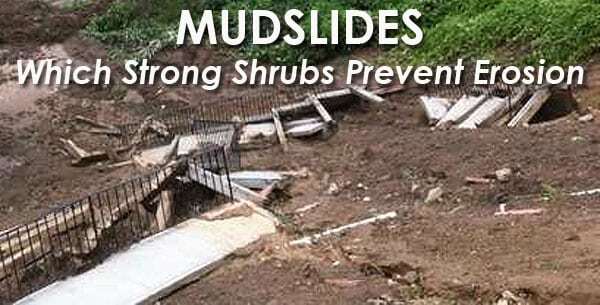 But there are solutions, and your garden can stop those mudslides in their tracks. Let’s take a look at mudslide prevention, how to strategize a landscape plan against them, and which strong southern California shrubs can stop erosion and keep your home and your belongings safe from the elements! A mudslide and a landslide are essentially the same thing: masses of rock, debris, or earth moving down a slope. Mudslides are also known as debris flows if you want to get scientific, and they are fast-moving landslides that usually flow in channels. Homeowners who notice a lack of vegetation around their homes along with seasonal torrential rainfall should be worried about the possibility of mudslides. Wildfires, forest clearing, inclement weather, earthquakes, and new developments are particularly at risk for mudslides, but homeowners and building owners can take steps to prevent these disasters by planting the right strong shrubs around their properties. You’re also doing your neighbors downslope a favor; the more shrubbery you plant, the better their chances of escaping damage when a natural disaster strikes. Sounds like a win-win, right? Mudslides are caused by loss of slope stability — usually by weather and seismic events like heavy rains, droughts, earthquakes, and even volcanic eruptions. (In Southern California, we don’t worry about that last one, but they definitely do in Hawaii.) Basically, unanchored topsoil on a non-vegetated slope turns into slippery mud during a big rainstorm and starts to slide down steep slopes. Wildfires can turn the vegetation on slopes into ash, as well, leading to mudslides in the mountains or the hills. Let’s get serious for a moment here: mudslides cause up to 50 deaths per year in the United States, and broken utility lines and destruction of roadways and railways can put more people in danger. Overall, mudslides or debris slides are something we want to prevent, and nature has an excellent way of doing that. Southern California has strong, native shrubs that can anchor topsoil down and completely prevent mudslides in your neighborhood, many of which are available at your local Green Thumb stores. Which Native California Shrubs Can Prevent Erosion? All of these shrubs are in stock at Green Thumb unless otherwise noted, or we will happily order them for you. Plants such as shrubs, trees, grasses, and wildflowers all work together to hold topsoil on steep slopes in southern California neighborhoods, including what we call pioneer plants that fill in the bare soil while strong shrubs and trees hold the deeper soil in place to prevent erosion. The more roots in the soil, the better; a combination of surface, medium-deep, and very deep roots will keep your hillside in place. When planting shrubs or any type of plant, it’s important to know which thrive in sun, which in shade, and which are drought tolerant, especially in drought-prone Southern California and inland locations. There may also be other qualities that gardeners and homeowners are looking for in the shrubs they plant, including aromatic or lovely flowers, bright berries, or bee-attracting varieties. Coastal sagebrush, for instance, is aromatic and thrives in arid climates, while being easy to grow and hard to dislodge. Bladderpod has bright yellow flowers that bees and hummingbirds love, and all varieties of sage attract bees well. One of the most fantastic things about shrubs is their toughness–dislodging them is difficult even for torrential rains when they are planted and maintained properly. The larger shrubs we’ve listed here are excellent for providing shade to your home or buildings, and Toyon can provide both privacy and a home for native Southern California birds. Shrubs are also known to be drought-tolerant and can save on landscape watering and costs. Depending on whether your home or building is in a coastal or inland location, you may have an easier time growing some of these shrubs than others. Call us up at Green Thumb or stop by one of our many locations to find out which ones will work best for you. Shrubs are easy to plant and transport because they are smaller than trees, and additional benefits: erosion prevention on your property, attract birds and bees, keep pests at bay, and create shade and privacy which make them favorites among landscapers. Shrubs you plant in Southern California should be drought-resistant or able to thrive in coastal regions, depending on your location. The experts at Green Thumb nurseries can help you find just the right varieties for your lifestyle, requirements, and climate, as well as give you excellent gardening advice for the plants you already have. In Southern California, we’re lucky enough to be able to plant and enjoy gardens, shrubbery, wildflowers, and other plants all year long–but we’re also unlucky enough to live through our share of mudslides and torrential rainfall that can damage our belongings and property at times. Green Thumb nurseries have five locations in Southern California and are happy to help using expert knowledge. Let us guide you through your strong shrub choices to prevent mudslides from affecting you and your family, and leave the research to us. Here’s to another glorious, sunny, mudslide-free spring in your neighborhood. Stop on by and talk to us next time you’re in the area, and get planting!